Talk about the catch of the day. A Chinese fisherman caught a massive whale shark in the waters off Fujian province over the weekend. 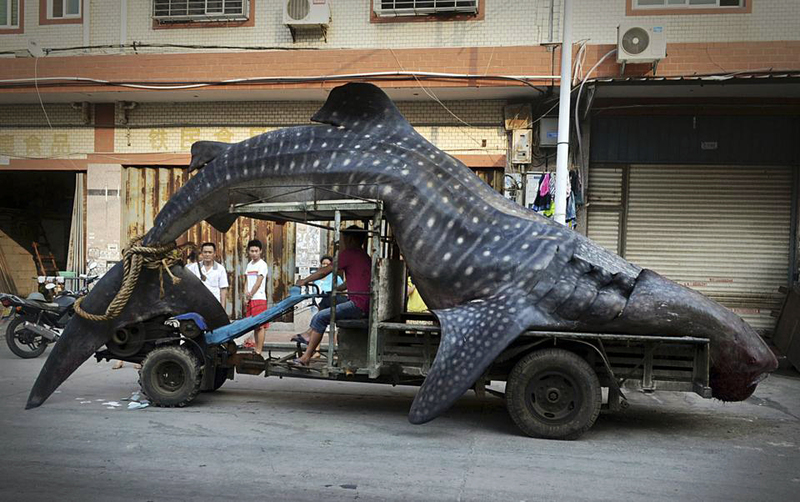 Photos of the 13-and-a-half-foot, 2-ton fish being transported to market through the streets of Xiaozhi have caused a bit of a stir in China, where the whale shark is endangered. But according to local media reports, Capt. Cai Chengzhu says his fresh catch was an accident — and that the giant shark became stuck in his net and died while the crew was trying to release it. Chengzhu said he was hoping to get between 10,000 and 20,000 yuan for his fishy freight before he was stopped by Fujian fishery officials, the Independent reports. The whale shark (or Rhincodon typus) was first discovered in South Africa in 1829. It is the largest known extant fish species and can get as long as 30 feet — twice as big as the one Chengzhu snared — and can live up to 100 years.